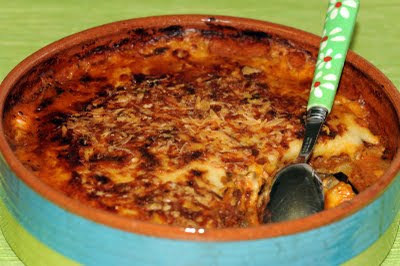 In a real Moussaka, eggplant is fried in olive oil. Yet, since eggplant can absorb what seems like an insane amount of oil, I decided to steam mine instead. Healthier and nobody really notices it because this recipe has so much in it. I generally use ground lamb but I have done it with beef or buffalo meat as well. Yes, it might be one of my "less" healthy recipes... but trust my family (and friends who tried it! ), it's really worth it! And as long as you "balance out" over the course of one week, you don't have to feel guilty about eating Moussaka! Bon Appétit! - 1 large eggplant, sliced in big slices. Add the tomato sauce and warm up the whole mixture while you prepare the Sauce Béchamel. In a pot melt butter over medium heat. When the butter starts to bubble, pour in the flour and whisk for 2-3 minutes until golden blond (not brown! ).This creates the "roux". Serve warm with a green salad on the side. I have started to like it a little bit spicy so I add Tabasco sauce (hot sauce) when eating it. I use a pressure cooker to steam the eggplant; it takes less than 3 minutes. I don't care if the eggplants are mushy because they'll be covered by the meat and the Béchamel. I don't use canned tomato sauce; I have found a tomato-basil sauce in a glass jar that I like and use as a base for some of my recipes. You might need to add more sauce if you are cooking it with beef or buffalo since lamb releases more fat. Voila la recette que je recherchais..
Merci, je vais la faire cette semaine pour mon fils Benoît..